The deterioration in immune function with aging is thought to make a major contribution to the increased morbidity and mortality from infectious disease in old age. One aspect of immune senescence is the reduction in CD8 T cell repertoire as due to the accumulation of oligoclonal, memory T cells and a reduction in the naive T cell pool. CD8 T cell clonal expansions accumulate with age, but their antigenic specificity remains unknown. In this study, we show that in elderly individuals seropositivity for human CMV leads to the development of oligoclonal populations of CMV-specific CTL that can constitute up to one-quarter of the total CD8 T cell population. Furthermore, CMV-specific CTL have a highly polarized membrane phenotype that is typical of effector memory cells (CD28−, CD57+, CCR7−). TCR analyses show that CMV-specific CTL have highly restricted clonality with greater restriction in the larger expansions. Clonal analysis of the total CD8 T cell repertoire was compared between CMV-seropositive and CMV-seronegative donors. Thirty-three percent more clonal expansions were observed in CMV-seropositive donors in comparison with seronegative individuals. These data implicate CMV as a major factor in driving oligoclonal expansions in old age. Such a dramatic accumulation of virus-specific effector CTL might impair the ability to respond to heterologous infection and may underlie the negative influence of CMV seropositivity on survival in the very elderly. Recent studies have indicated that certain parameters of the adaptive immune response decline in elderly humans. This is most marked in the CD8 T cell subset, which displays a decrease in both responsiveness and normal function (1, 2, 3, 4). The CD8 T cell repertoire becomes less diverse in old age due to reduced thymic output (4, 5, 6) and the accumulation of clonally expanded memory CD8 T cells as a consequence of prolonged antigenic stimulation throughout life (7, 8). However, the mechanisms that select and maintain such clonal expansions are not yet known. It has been suggested that repeated or persistent infections with viruses such as influenza, CMV, and EBV may drive responses that result in large T cell clones, as restricted TCR usage has been reported against certain class I epitopes derived from these pathogens (9, 10, 11). Another study has shown that clonal expansions are more prominent in CD8 T cells that are CD57 positive (12). Interestingly, CMV seropositivity is closely associated with increases in the size of the CD57+ CD8 T cell pool, which is thought to represent a highly differentiated population of late memory cells (13, 14). Furthermore, CMV seropositivity is associated with increases in CD8 count in old age (15) and has been documented to have negative influences on immune parameters in the very elderly (16). CMV is a species-specific β-herpesvirus that is present in the majority of the population (60–90%) and causes significant disease in immunocompromised hosts such as stem cell transplant recipients, HIV-positive subjects, and congenitally infected newborns. However, in the immunocompetent host, primary infection is usually asymptomatic, followed by a period of lifelong persistence. Although CMV may enter a state of viral latency in some cell types, studies in animal models and immunosuppressed humans suggest that the cellular immune response is a key component in protection against CMV-related disease (17, 18, 19). CD8 T cells are particularly important in controlling viral replication, and the viral gene products pp65 and IE appear to be the major targets for the CD8 T cell response (reviewed in Ref. 20). Work with novel reagents, such as fluorescent HLA-peptide tetramers (21), has shown that the CMV-specific CD8 T cell response can measure up to several percent of the CD8 T cell subset (22). These T cells are often derived from a few clones that have undergone extensive expansion in vivo (11). Phenotypic and functional studies have shown that CMV epitope-specific CD8 T cells are also high in CD57 expression and low in CD28 (22), which implies that these cells are highly differentiated long-lived populations. These data form the basis for our hypothesis that CMV-seropositive elderly individuals will have accumulated high frequencies of oligoclonal CMV epitope-specific CD8 T cells. HLA-peptide tetramers incorporating immunodominant pp65 epitopes were used to measure epitope-specific CD8 T cell frequencies and also for immunophenotyping. TCR β-chain V region (TCRBV)3 usage was determined with TCRBV mAb and later by sorting tetramer-binding cells and performing TCRBV family-specific PCR and DNA sequencing. Results indicate very high frequencies of CMV epitope-specific CD8 T cells in old age donors, which are monoclonal or oligoclonal. Analyses of total CD8 subsets in CMV-seropositive and CMV-seronegative donors showed a higher number of clonal expansions in seropositive donors, suggesting that CMV indeed plays a major role in driving the host CD8 T cell repertoire toward oligoclonality. Study donors were healthy local individuals aged between 60 and 95 years, recruited with formal consent. Initial bleeds were used to screen for CMV status and HLA-A2 and HLA-B7 seropositivity. A latex agglutination kit (CMVScan; BD Biosciences, Oxford, U.K.) determined CMV serostatus using plasma samples. HLA-A*0201+ donors were identified by immunofluorescence using the mouse anti-human HLA-A2 mAb BB7.2 (BD Biosciences). HLA-B*0702+ donors were identified by direct immunofluorescence using a PE-conjugated anti-HLA-B7 mAb (Serotec, Oxford, U.K.). Donors of interest were then selected for further bleeds. These were then tissue typed for HLA class I alleles by the Blood Transfusion Service using DNA extracted from EDTA-blood samples. Volunteers from the laboratory aged 20–55 years were also recruited and used as a control population. CMV pp65 peptides corresponding to residues 495–503 (NLVPMVATV) and 417–426 (TPRVTGGGAM) were synthesized by Research Genetics (Huntsville, AL). Peptides were dissolved in DMSO at a concentration of 5 mg/ml and stored at −20°C. HLA-A*0201 and HLA-B*0702 tetramers incorporating pp65 residues 495–503 (NLVPMVATV) and 417–426 (TPRVTGGGAM), respectively, were synthesized using standard methods, as described (21). The HLA-A*0201 and HLA-B*0702 tetramers are hereafter referred to as NLV and TPR tetramers, respectively. PBMC were isolated from heparinized blood samples by Ficoll density gradient centrifugation (Lymphoprep; Axis Shield, Oslo, Norway). Cells were used immediately or cryopreserved. For staining experiments, 2 × 105 PBMC were incubated with NLV or TPR tetramer at 37°C for 30 min. After washing with PBS (containing 2% FCS), cells were incubated with tricolor-conjugated anti-CD8 mAb (Caltag Laboratories, San Francisco, CA) for another 30 min on ice. Cells were washed and then fixed in PBS containing 2% formaldehyde and 2% FCS. Samples were analyzed on a Coulter Pharmaceutical (Seattle, WA) XL flow cytometer and later using WinMDI version 2.8 software (available from The Scripps Research Institute, website at http://facs.scripps.edu/software.html). For three-color immunofluorescence, one of a panel of mAb directly conjugated to FITC was added at the same time as the anti-CD8 tricolor Ab. The panel included anti-CD57 (Serotec), anti-CD45RA, anti-CD45RO, anti-CD27, anti-CD28, anti-HLA-DR, anti-CD38, and anti-CD69 (all BD PharMingen, San Diego, CA). TCRBV usage was determined by indirect immunofluorescence. After tetramer staining at 37°C, cells were incubated on ice with saturating amounts of one of a panel of mouse anti-human TCRBV mAb (BV1, BV2, BV3, BV4, BV5.1, BV5.2, BV5.3, BV6.7, BV7, BV8, BV9, BV11, BV12, BV13.1, BV13.6, BV14, BV16, BV17, BV18, BV20, BV21.3, BV22, and BV23; Immunotech, Luminy, France). Cells were washed and then incubated with a goat anti-mouse IgG-FITC mAb (DAKO, Ely, U.K.). Consequently, incubation with the mouse anti-human CD8 tricolor mAb was performed last. Mouse serum (Serotec) was used to block binding of anti-mouse IgG-FITC mAb to the mouse anti-human CD8 mAb. Compensation and isotype controls were conducted simultaneously. PBMC from HLA-matched CMV-seronegative donors and HLA-mismatched CMV-seropositive donors were also used as controls. Tetramer staining did not exceed background levels (<0.02% of CD8 T cells). ELISPOT assays for peptide-induced IFN-γ-producing cells were conducted, as described elsewhere (23), using undepleted PBMC and also PBMC depleted of Ag-specific CD8 T cells by magnetic selection. Spots were counted and expressed as percentage of PBMC that produce IFN-γ in response to peptide. Freshly isolated PBMC of donors with high frequencies of tetramer-binding cells were tested for cytotoxicity in standard 51Cr release assays, as described (24). This was conducted using the miniMACS system, according to the manufacturer’s instructions (Miltenyi Biotec, Bisley, U.K.). Ag-specific CD8 T cells were enriched to greater than 97% of the positively selected cell population. These cells were used for RT-PCR, as described below. Negatively selected cells, depleted of Ag-specific CD8 T cells, were used alongside nondepleted cells (PBMC) in IFN-γ ELISPOT assays as controls. RNA from 1–5 × 105 magnetically sorted Ag-specific cells was extracted using TRIzol (Life Technologies, Grand Island, NY), according to the supplier’s instructions, and dissolved in a final volume of 15 μl. cDNA synthesis was performed using the reverse-iT first strand synthesis kit (ABgene, Epsom, U.K.). A total of 11 μl RNA solution was reverse transcribed at 42°C for 1 h using an anchored oligo(dT) primer in a 20 μl final volume. cDNA derived from magnetically selected Ag-specific CD8 T cells was used as template in PCR with TCRBV and TCR β-chain C region (TCRBC) primers incorporating NotI and SalI restriction sites, respectively (TCRBV6, GCATTCAGCTGCGGCCGCAAGGGATCTTTCTCCACCT; TCRBV8, GCATTCAGCTGCGGCCGCTGAAGATCCAGCCCTCAGAACCC; TCRBV13.1, GCATTCAGCTGCGGCCGCTCAGGCTGCTGTCGGCTG; TCRBV14, GCATTCAGCTGCGGCCGCACTGATAAGGGAGATGTTCCTGAAG; and TCRBC, CGTTTGTCGTCGACCTCCTTCCCATTCACC). For TCR α-chain analysis, cDNA was poly(G) tailed using TdT and used as template for anchor PCR using a 3′C α primer containing a SalI site (TGACCGCAGTCGACAGACTTGTCACTGGATT) and a 5′poly(C) primer containing a NotI site (GCATTCAGCTGCGGCCGCCCCCCCCCCCCCCC), as described elsewhere (25). PCR amplifications were performed in 50 μl reaction volumes containing 50 mM KCl, 10 mM Tris-HCl (pH 8.5), 2.5 mM MgCl2, 0.5% DMSO, 10 mM dNTPs, 1.0 μM each primer, and 1 U AmpliTaq DNA polymerase (PerkinElmer, Wellesley, MA). PCR parameters used were: 5-min initial denaturation at 94°C, then 5 cycles of 94°C (1 min), 65°C (1 min), and 72°C (2 min), followed by 30 cycles of 94°C (1 min), 58°C (1 min), 72°C (2 min), and a final extension of 72°C for 5 min. Products were purified and then digested overnight with NotI and SalI restriction enzymes (Roche, Lewes, U.K.). The digested PCR products were then cloned into M13 phagescript (Stratagene, La Jolla, CA) and sequenced using a Bigdye DNA sequencing kit (PE Applied Biosystems, Foster City, CA). For clonotype analysis of total CD8 subsets in CMV-seropositive and CMV-seronegative donors, ∼10 × 106 PBMC were depleted of CD4 T cells using CD4 dynabeads (Dynal, Wirral, U.K.). cDNA was synthesized from CD8-enriched PBMC, as described above, and used as template for PCR using primers specific for TCRBV regions 1–24 (26) together with the GC-clamped TCRBC primer. PCR amplifications were performed in 30 μl reaction volumes containing 50 mM KCl, 10 mM Tris-HCl (pH 9.0), 1.5 mM MgCl2, 0.5% DMSO, 10 M dNTPs, 0.5 μM each primer, and 1 U AmpliTaq DNA polymerase (PerkinElmer). PCR parameters used were: 1-min initial denaturation at 94°C, then 40 cycles of 94°C (30 s), 60°C (30 s), and 72°C (40 s), followed by final extension of 72°C for 5 min. DGGE analysis was conducted using 12 μl PCR product, as described by thor Straten et al. (26). Gels contained 6% polyacrylamide (Acrylogel S solution; BDH-Merck, Poole, U.K.) and a gradient of urea (Sigma-Aldrich, St. Louis, MO) and formamide (Fluka, Gillingham, U.K.) from 20–80%, and were run at 160 V for 4.5 h in 1 × TAE (0.04 M Tris-HCl, 0.04 M acetate, 1 μM EDTA, pH 8.3) running buffer maintained at 58°C in a temperature-controlled bath. Gels were then stained with ethidium bromide and visualized under UV light. Each visible discreet band was interpreted as a clonal expansion and recorded. The reproducibility was very good, as indicated by gels loaded with independent PCR products on separate occasions. Of the 100 healthy subjects recruited, 56 donors were either HLA-A*0201+ and/or HLA-B*0702+ (38 donors were HLA-A*0201+, 32 were HLA-B*0702+, and 14 were both HLA-A*0201+ and HLA-B*0702+). Thirty-two of these fifty-six donors were CMV seropositive (57%). Tetramer staining was performed on these donors using the two tetramers (named A2-NLV and B7-TPR), and the results are shown in Table I⇓. PBMC from CMV-seronegative individuals or donors of irrelevant HLA type did not stain more than background (0.02% of CD8 T cells). Fig. 1⇓A shows tetramer-staining profiles of selected donors. Where possible, donors were studied at six monthly intervals and tetramer staining was repeated. Donors aged 20–55 were bled as a control group and tested in the same way. Fig. 1⇓B shows a comparison of the tetramer-staining profiles of the two groups of donors. A, High frequencies of CMV epitope-specific CD8 T cells in healthy old age individuals. Donor PBMC were incubated with saturating amounts of HLA-peptide tetramers incorporating pp65495–503, NLVPMVATV, and pp65417–426, TPRVTGGGAM, at 37°C, washed, and then incubated with anti-CD8 tricolor on ice. After washing, cells were fixed and analyzed by flow cytometry. All plots shown are gated on lymphocytes visualized by side and forward scatter. B, Comparison of tetramer-staining frequencies in young and old donors. Tetramer staining was conducted on PBMC from young laboratory donors in addition to the old age donor group. Values shown on the y-axis indicate percentage of CD8 T cells stained with CMV tetramer. Significance was determined using the Mann-Whitney U test. Of the 22 HLA-A*0201+ donors, 17 had detectable NLV-specific CD8 T cells with frequencies ranging from 0.1 to 8.5% of the total CD8 subset. The mean frequency was 1.4%, which is higher than the average observed in 26 younger donors tested (0.4%; range 0.05–1.7%). A total of 18 of 19 HLA-B*0702+ CMV-seropositive donors had detectable numbers of TPR-specific CD8 T cells (range 0.1–23%). Strikingly, in one donor (025), this tetramer stained 23% of CD8 T cells, which is among the highest reported frequencies outside the setting of acute viral infection. The mean frequency of TPR-specific binding was 4.1% of CD8 T cells, again higher than that observed in 14 younger donors (range 0.1–2.5%, mean 0.77%). The average TPR tetramer staining was at least double that of the NLV tetramer staining, which is consistent with findings by Gillespie et al. (22). Donor 040 was unique because between the second and third bleeds, the tetramer-staining frequency had dropped by approximately two-thirds. Such dramatic fluctuations were not observed in other donors. Data from experiments with the two tetramers were pooled and compared between the age groups for differences. The observed difference in CMV tetramer staining was found to be statistically significant (p < 0.003) using the Mann-Whitney U test. This supported our hypothesis that higher frequencies of CMV epitope-specific T cells can be detected in older individuals. Tetramer staining can accurately determine the frequency of CMV epitope-specific CD8 T cells, but does not provide information on the functions of such cells. One such function is the production of IFN-γ, and this can be measured using the ELISPOT method. We conducted ELISPOTs using PBMC incubated with the two immunodominant peptides NLV and TPR. By indirect calculation, between 5 and 60% (mean 35%) of tetramer-binding cells were able to produce IFN-γ (Fig. 2⇓A), demonstrating that a large proportion of Ag-specific cells is indeed functional. Similar values have been reported with other Ag (23) and demonstrate that not all Ag-specific CD8 T cells are able to produce IFN-γ in an in vitro assay. A, CMV epitope-specific T cells in elderly donors determined by tetramer staining and ELISPOT. Old age donors were also tested in IFN-γ ELISPOT assay following overnight incubation with NLV or TPR peptides. Top, Comparison of tetramer-staining frequencies and ELISPOT frequencies. Middle, Relative responses to A2-NLV and B7-TPR peptides in donors positive for both HLA-A2 and HLA-B7. Bottom, ELISPOT responses to NLV peptide in selected HLA-A*0201+ donors using unfractionated PBMC and PBMC depleted of tetramer-binding cells as controls. B, Ex vivo peptide-specific cytotoxic activity in old age donors. Peptide-specific cytotoxicity was demonstrated in standard 5-h 51Cr release assays using freshly isolated donor PBMC and HLA-matched LCLs as targets. E:T ratios used were 100:1, 50:1, and 10:1. Target cells were pulsed with either the relevant CMV peptide TPRVT GGGAM (▪), irrelevant EBV peptide RPQKRPSCI (□), or DMSO (▴). Donors 025, 041, and 040 are all CMV seropositive, whereas donor 056 is CMV seronegative. Assays using a TPR-specific clone were also performed as a further control. The second test performed was to show ex vivo cytotoxicity using freshly isolated PBMC against HLA-matched lymphoblastoid cell line (LCL) targets loaded with the relevant peptide Ag in conventional chromium release assays. Four HLA-B*0702+ donors were selected that were either CMV seropositive or seronegative. All seropositive donors tested had high levels of tetramer staining (see Table I⇑) and so were expected to demonstrate lysis at E:T ratios without enrichment of Ag-specific T cells. Our results demonstrated that cells from two of the three CMV-seropositive donors were cytotoxic, as significantly high levels of lysis were observed using LCL targets loaded with the relevant peptide with minimal lysis against irrelevant peptide or DMSO. No killing was observed in assays using the seronegative donor (Fig. 2⇑B). These results confirmed that elderly individuals possess circulating CMV-specific CD8 T cells that are functional through both cytolytic and noncytolytic mechanisms. The cell surface phenotype of tetramer-binding cells was studied using three-color immunofluorescence. The complete data are displayed in the table section of Fig. 3⇓ with flow cytometric plots from two selected donors also shown. With regard to the membrane tyrosine phosphatase CD45, tetramer-staining binding cells generally expressed more of the high m.w. isoform CD45RA than the low m.w. isoform CD45RO. CMV-specific CD8 T cells from all donors tested were predominantly CCR7−, implying that they are mainly effector memory cells according to a recent model (27). Tetramer-binding cells are also largely CD57+, which is a marker that represents an increased fraction of the CD8 T cell subset in CMV-seropositive donors. Lack of CD27 and CD28 expression is thought to mark highly differentiated long-lived populations, and in all but one case (as described later) tetramer-binding cells were mainly CD28−. CD27 expression patterns were not as polarized, although generally most donors had more CD27− cells than CD27+. Staining with CD69, HLA-DR, and CD38 was conducted to determine whether tetramer-staining cells had a phenotype associated with activated T cells, but the vast majority (>90%) of cells were negative for all three markers. Intracellular staining revealed that the majority of tetramer-binding cells expressed high levels of perforin, indicative of cytotoxicity. Furthermore, there was high expression of Bcl-2 and minimal ki67, implying resistance to apoptosis and low levels of proliferation, respectively. So the common feature was that the majority of CMV epitope-specific CD8 T cells were highly differentiated effector memory T cells, although not activated and not in cell cycle. Cell surface phenotype analysis of CMV epitope-specific CD8 T cells in old age donors. Cells were stained with tetramer, washed, and then stained with one of a panel of FITC-conjugated mAb and tricolor-conjugated anti-CD8. For intracellular staining, cells were stained with tetramer, then anti-CD8, fixed and permeabilized, and then stained with anti-perforin, anti-Bcl-2, or ki67 mAb. A, Table showing complete data from 10 donors with percentage expression of each phenotypic marker displayed (see key). B, Plots of data from 2 donors are shown (donor 025 having a typical phenotype and donor 040 having an atypical phenotype). Interestingly, donor 040 was unique, as the tetramer-binding cells were almost exclusively CD57−, CD28+, CD45RO+, and perforin− (see lower panel of plots in Fig. 3⇑B). The level of TPR tetramer staining in this donor fell over a period of 12 mo from 12 to 4% of CD8 T cells. It is possible that this donor was only recently infected with CMV and the 12% observed early on was in fact the initial expansion during a primary immune response. Between the second and third bleeds, the drop in staining may have reflected culling of TPR-specific CD8 T cells. Unfortunately, cells from the early time points were not available for Bcl-2 staining to confirm this. TCRBV expression of tetramer-binding cells was initially studied using TCRBV-specific mAb. For A2-NLV tetramer binding, our results showed that a few common β-chains were used (Fig. 4⇓A). The most commonly expressed β-chain was TCRBV13.1, and other β-chains used were TCRBV14, TCRBV8, TCRBV20, TCRBV3, TCRBV22, and TCRBV6.7. TCRBV13.1 was also the predominant β-chain used in donors with larger tetramer-staining populations (Fig. 4⇓C). TCRBV expression of CMV tetramer-staining cells. TCRBV expression was determined by indirect immunofluorescence. After staining with tetramers, cells were stained separately with a panel of mouse anti-human TCRBV mAb, followed by goat anti-mouse IgG-FITC. Tetramer staining is on the vertical axis, and values shown represent the proportion of tetramer-staining CD8 T cells expressing the given TCRBV. All plots are gated on CD8-positive events. A, TCRBV13.1 and A2-NLV tetramer staining of HLA-A*0201+ donors. B, TCRBV14 and B7-TPR tetramer staining of selected HLA-B*0702+ donors. C, Comparison of TCRBV expressed by A2-NLV tetramer-binding cells in seven HLA-A*0201+ donors. We then determined the clonal nature of these NLV-specific CD8 T cells. Tetramer-binding cells were purified by magnetic selection using anti-PE beads and then used for RT-PCR. The junctional regions of TCRBV13.1 chains expressed by NLV-specific CD8 T cells were analyzed. A comparison of the TCRBV13.1 sequences between the four donors studied showed that one transcript is shared (underlined in Table II⇓). This differs by only 2 aa in the complementarity-determining region 3 (CDR3) of a published clonotype with identical J segment and C region (11). Donor 001 appeared to use this common BV13.1 clonotype exclusively, as all recombinant plaques sequenced were the same. In contrast, two TCRBV13.1 transcripts were identified in donors 002, 004, and 005. Donors 004 and 005 also used TCRBV8 and TCRBV14, respectively, and it was discovered that these also included just one or two transcripts. TCRBV usage of HLA-B*0702-restricted TPR-specific CD8 T cells was only determined in 4 of 10 donors studied using TCRBV-specific mAb. In each of these cases, TCRBV14 was the β-chain involved (Fig. 4⇑B). For the other 6 donors, B7-TPR tetramer-staining cells were purified magnetically and used for RT-PCR with TCRBV-specific primers. In each case, PCR product was observed in the reaction with BV6 primer. Sequencing of the TCRBV6 PCR products showed that 5 of 6 donors appeared to use a single TCRBV6.4 sequence (Table II⇑). In 2 donors (025 and 029), this sequence differed by only 1 aa in the CDR3 region. The transcript used by donor 025 was compared with a series of published clonotypes (11) and found to match one common clonotype exactly at the nucleotide level. The other four donors used quite different TCRBV6.4 clonotypes, of which two were very similar (donor 027 and 041) to reported sequences. Analysis of TCR α-chain V region (TCRAV) usage was also carried in three donors (025, 040, and 041). Results from anchor PCR showed that there was also restriction in TCRAV sequence, which displayed homology with those reported elsewhere (11). Two donors used a single TCRAV transcript (donors 025 and 040 used TCRAV3.1 and TCRAV16.1, respectively), and the third donor used two transcripts (TCRAV6.1 and TCRAV16.1), which only differed by a few amino acids in the CDR3 region (Table II⇑). Interestingly, although different TCRAV usage was observed between individuals, there was conservation of usage of the TCRAJ segment, which is a common pattern for Ag-specific CD8 T cell clones (28). Combined with the data on TCRBV usage, this showed that CMV-specific CD8 T cells were composed of a few clones that had undergone massive expansion in vivo. As we had shown that individual CMV epitope-specific CD8 T cells could represent up to 23% of the total CD8 subset and that these were often oligoclonal, it was felt likely that such populations could represent a major contribution to the clonal CD8 repertoire that is observed in elderly individuals. Therefore, we asked whether there was a difference in total numbers of clonal expansions between individuals who have been exposed to CMV and those who have not. This comparison was made using CD8-enriched PBMC after depletion of CD4 T cells by magnetic selection (CD4 T cells were less than 1% of negatively selected cells), RT-PCR of TCR sequences, and subsequent clonotype analysis by DGGE, a method that can differentiate reliably between DNA sequences with different sequences. Initial experiments confirmed the validity of the technique using both cloned TCRBV DNA and polyclonal T cell populations such as CD4 T cells derived from a young donor (both CMV and EBV seronegative). Clonal expansions are represented by the presence of a discreet band due to the abundance of identical DNA molecules derived from a T cell clone in a background of other different T cells. The absence of any bands is interpreted as a population being polyclonal and not containing significantly large clonal expansions. The sensitivity of detection of a clonal band was determined using cDNA from serial dilutions of a T cell clone in a polyclonal background (purified CD4 T cells derived from a healthy laboratory donor). In our hands, the detection limit was ∼10% of a given TCRBV subset (not shown), which can represent between 0.2 and 0.5% of CD8 T cells. 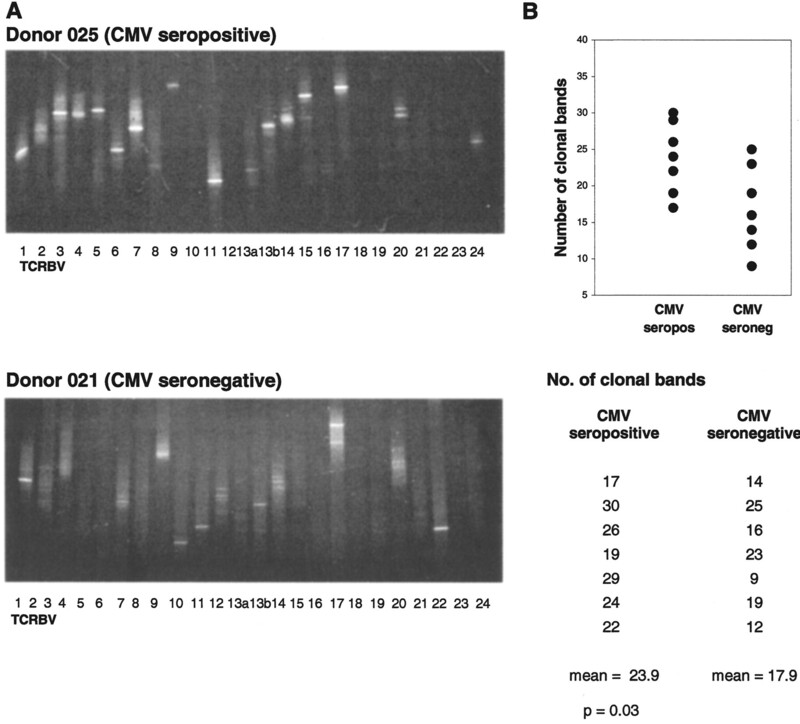 Seven CMV-seropositive and seven CMV-seronegative donors were studied, and examples of gels are shown in Fig. 5⇓A. Bands were counted in each donor (Fig. 5⇓B), and the results demonstrate that a significantly greater number of clonal expansions are observed in seropositive donors (mean 23.9) than in seronegative donors (mean 16.9) (p = 0.03). The difference between the means shows that over 30% more clonal expansions are observed in seropositive donors. Global TCRBV repertoire in CMV-seropositive and CMV-seronegative donors. PBMC were depleted of CD4 T cells using CD4 microbeads and then used for RT-PCR. Amplifications were performed with primers specific for TCRBV1–24 regions and a GC-clamped TCRBC region primer. Products were run on DGGE gels with a gradient of 20–80% denaturants for 4.5 h at 160 V, and then stained with ethidium bromide. A, DGGE profiles of donors 025 (CMVpos) and 021 (CMVneg). B, Comparison of total clonal expansions observed in seven CMV-seropositive and seven CMV-seronegative donors. Significance was determined using the Student’s t test. The gradual deterioration in immune function that occurs with aging has been termed immune senescence. This is manifest both as reduced in vitro immune responsiveness and impaired immune response to vaccination and acute infection (1, 2, 29). A major feature of immune senescence is the accumulation of clonally expanded memory CD8 T cells characterized by the lack of CD28 expression and the increased expression of CD57. Such cells are often clonal or oligoclonal, and their presence has been directly correlated with poor immune function. Expansion of CD57+ CD8 T cells has been associated with CMV seropositivity, and our study aimed to assess the influence of CMV seropositivity on the CD8 repertoire in the elderly. The use of fluorescent HLA-peptide tetramers allowed us to demonstrate that CMV epitope-specific CD8 T cells do indeed contribute a large fraction of the CD8 repertoire in elderly humans. The average frequency of CD8 T cells recognized by the two tetramers used in this study was 1.4 and 4.1%, respectively, but in several individuals staining was over 5% of all CD8 T cells. In one donor, 23% of CD8 T cells were specific for a single CMV epitope, and this is among the highest reported CD8 T cell frequency for any Ag outside the setting of acute viral infection. We also measured responses to a recently discovered IE-1 epitope restricted by HLA-B*0702 (30) in some of our donors using the IFN-γ ELISPOT assay, as we were unable to generate the tetramer. Extremely high responses were observed, and these often exceeded those against the pp65 epitope TPR (data not shown). Together these data reinforce the view that CMV may be the most immunodominant of the human viruses (31). As previously reported in younger donors (22), higher frequencies of B7-TPR-specific CD8 T cells are detected in comparison with A2-NLV-specific CD8 T cells. This immunodominance of the B7-TPR epitope is particularly marked in HLA-A*0201+/HLA-B*0702+ donors in whom these lowest levels of A2-NLV-specific cells were seen. The reasons for this extreme immunodominance are not clear, but may include higher frequencies of naive precursor cells before CMV exposure or differences in processing that result in higher levels of TPR peptide than NLV peptide on the surface of infected cells. Wide variation was seen in the frequency of tetramer staining between individuals, and this is likely to reflect factors such as HLA type, duration of seropositivity, or viral strain differences. How such large expansions arise is currently unclear. CMV is never cleared by the host, and although transcriptional viral latency may play a role in persistence (32), it is believed by some that periodical viral reactivation is quite common (33). This could lead to repeated stimulation of cognate T cells and the eventual accumulation of large populations of CMV-specific CTL. Whether such reactivations occur more frequently with aging is unknown, although the higher prevalence of CMV-specific IgM serology in the elderly suggests that this may indeed be the case (34). One striking observation in the study was the phenotype of CMV-specific CTL. First, there was less heterogeneity than reported previously (22). Second, with the exception of donor 040, the phenotype was that of highly differentiated effector CTL that are perforin+, which has previously only been reported as the dominant phenotype in immunosuppressed patients (35). Donor 040 had CTL with a less differentiated phenotype, and interestingly, ex vivo peptide-specific cytotoxicity could not be demonstrated in this case. Such properties of perforin− T cells have been reported previously (36). 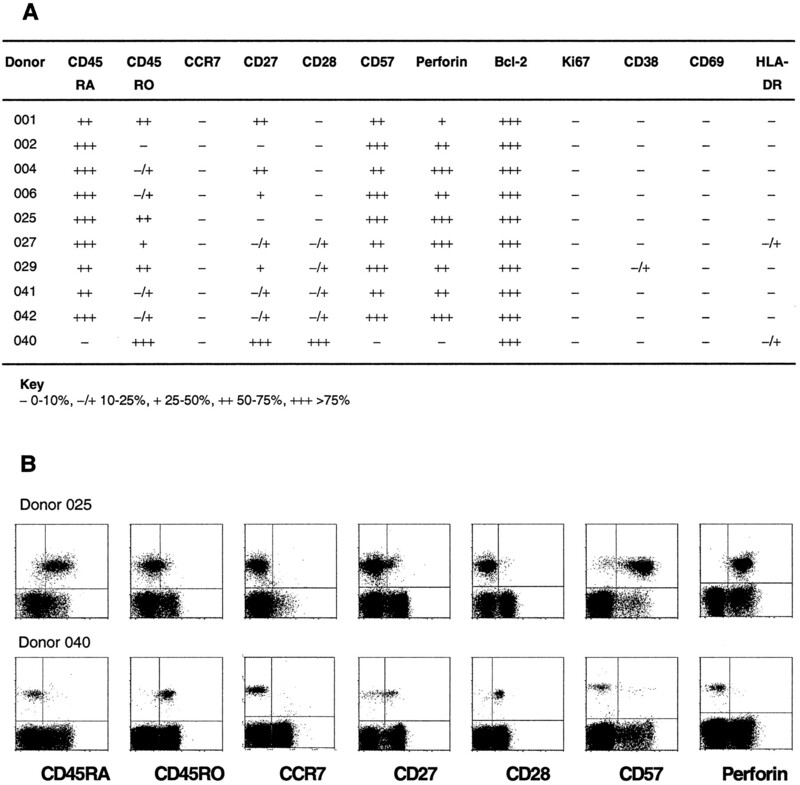 It is possible that this donor had experienced a recent primary infection, as the gradual development of CD8 T cells from a CD57− phenotype to CD57+ phenotype has been documented following primary infection (37). The phenotype of the CMV-specific CTL supports the notion that the general increase in size of the CD57+ CD28− T cell subset observed in old age donors may largely reflect increases in CMV-specific CD8 T cell frequencies. This phenotype has been reported in other settings such as rheumatoid arthritis and HIV-1 infection (38, 39) and may be associated with the presence of increases in CMV-specific CTL. There was a common picture of high CD45RA expression with lower levels of CD45RO, indicating probable reversion of Ag-experienced CTL from a CD45RO+ state back to a CD45RA+ phenotype (40, 41). Furthermore, CTL displayed minimal levels of recent T cell activation markers and did not appear to be in cell cycle. These populations may indeed be poorly proliferative, as others have indicated that CD28− T cells have a distinct replicative history and shorter telomeres than CD28+ T cells (39, 42, 43). A recent report indicated that, in contrast to what we have demonstrated for CD8 immunity to CMV, the varicella zoster virus-specific CD4 T cell response in old age donors was actually smaller than that seen in young donors (44). This difference may perhaps be explained by the site of viral persistence for varicella zoster virus being in a nonprofessional APC. It would be of great interest to determine the CD4 response against CMV in our elderly population. Indeed, absolute CD4 counts do diminish with aging, and CD4 hyporesponsiveness is well documented in such individuals (45). We have also observed that CMV-specific T cells are uniformly bcl-2+, indicating resistance to apoptosis, which is reminiscent of cells that have reached replicative senescence in cell culture (46). Whether immune homeostatic mechanisms are dysfunctional is unclear from our data, but arguable considering the reported decline in IL-2 production by CD4 T cells with age (45). This may result in diminished Ag-induced cell death of virus-specific cells during the resolution of an immune response later in life, leading to a persistence of CD8 T cell clones. Analysis of TCR usage indicated that CMV-specific T cells were invariably oligoclonal, with several cases showing a single T cell comprising over 90% of the total population. The data confirm that CMV-specific CTL can undergo dramatic expansion in vivo (11). Moreover, when the clonality of CMV-specific populations was correlated with the magnitude of each expansion, it was clear that the larger expansions were more restricted in their clonality than smaller expansions. 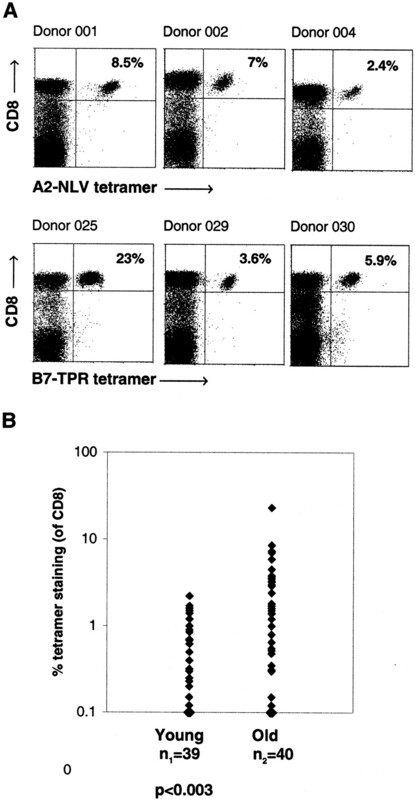 NLV tetramer-binding cells in donors 001 and 002 represented 8.5 and 7% of the CD8 population and were dominated by a single TCR β-chain in both cases. In contrast, those donors with lower frequencies of NLV-specific CTL had more heterogenous clonality with at least three sizeable clones. These data imply that clonal selection occurs during infection, possibly as a result of competition for Ag on APC. TCR sequence analysis showed some conservation of TCR usage between different donors, although this was not as marked as observed with certain other viral epitopes (9, 10). Interestingly, comparison of TCR sequences isolated from this study with those reported in a group of younger donors shows great similarities (11). This suggests that the same T cells that are stimulated upon initial presentation of CMV Ag during primary infection may well be maintained in the repertoire throughout the lifetime of the host. This would argue against a major role for immune exhaustion (47) in the immune response to these peptides. Comparisons of the global CD8 repertoires of CMV-seropositive and CMV-seronegative donors showed that CMV-seropositive individuals have, on average, seven more CD8 T cell expansions than CMV-seronegative persons. This equates to 32% more clonal expansions than the seronegative donors, suggesting that CMV seropositivity may contribute significantly to the development of clonal CD8 T cells with aging. One problem with this interpretation is the limited knowledge of actual clone size as a proportion of the CD8 repertoire. The presence of larger clonal expansions may result in the presence of fewer clonal bands than in other cases in which smaller expansions exist due to homeostatic constraints. Moreover, the Ag specificity of this excess number of clones was not determined; however, the observation that individual CMV epitope-specific responses can comprise several percent of the CD8 T cell subset and are invariably oligoclonal suggests that such clones may indeed be CMV specific. Further detailed analysis should be conducted to confirm this hypothesis. The finding that such a large proportion of the CD8 T cell subset can be focused on a single virus is of some surprise. Whether such a high investment in the CD8 T cell repertoire to a single pathogen is detrimental to the host remains unclear, although it is possible that it may impair the efficiency of immune response to other Ag. In this case, CMV-seropositive individuals may be at greater risk of morbidity and mortality from heterologous infections such as influenza. Although such an idea may appear exaggerated, recent epidemiological evidence has indeed identified CMV seropositivity as being associated with shortened survival in very elderly individuals (16). Our data provide one potential explanation for this finding, and together these data suggest that we may need to reconsider our current views on the benign nature of CMV carriage. In this case, greater attention may need to be given toward control of CMV replication in the general population, either by vaccination or perhaps drug therapy. We thank Per thor Straten for his kind assistance with setting up of the DGGE analysis. ↵1 This work was supported by the U.K. Medical Research Council (Grant G78/6045). ↵3 Abbreviations used in this paper: TCRBV, TCR β-chain V region; CDR, complementarity-determining region; DGGE, denaturing gradient gel electrophoresis; LCL, lymphoblastoid cell line; TCRAV, TCR α-chain V region; TCRBC, TCR β-chain C region. Hausmann, P. B., M. E. Weksler. 1985. Changes in the immune response with age. C. E. Finch, and E. L. Schneider, eds. Handbook of the Biology of Aging 412 Van Nostrand Reinhold Company, New York.